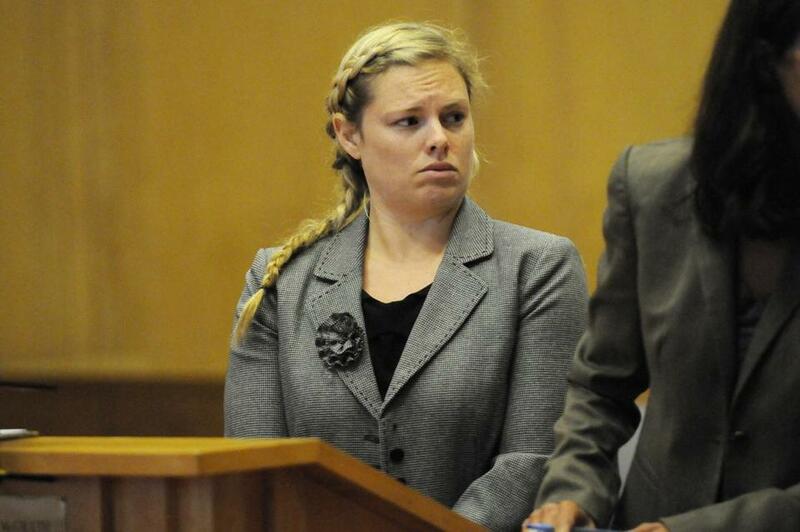 Elizabeth Backler, 28, of Newburyport, was arraigned in Lawrence District Court on Tuesday. LAWRENCE — A North Shore educator and swim coach engaged in an “abuse of power’’ by allegedly giving a 16-year-old North Andover High School student prescription drugs, taking the girl to dinner, and allowing the student into her home, a prosecutor said Tuesday. Elizabeth Backler, 28, was arrested Monday at her Newburyport home and appeared in Lawrence District Court on Tuesday. Prosecutors accuse Backler of providing the swim team member with the narcotic painkiller oxycodone after the girl complained of shoulder pain. Backler, who was an assistant swimming coach in North Andover for two years, is also accused of giving the girl muscle relaxers. “The victim stated that due to [the shoulder injury] the defendant had provided her with various prescription medications including Valium, Oxycontin, and muscle relaxers,” said Essex Assistant District Attorney Heidi Mader. Not guilty pleas were entered on Backler’s behalf to two counts of distribution of oxycodone and one count of distributing diazepam, a benzodiazepine. Backler no longer works for North Andover Public Schools, but is employed as a teacher in Amesbury, where officials say she has been suspended. Mader sought $1,500 bail, but Judge Mark Sullivan released her on personal recognizance. Amesbury Public Schools Interim Superintendent Gary Reese said in a statement that Backler has been placed on paid administrative leave from her job at the Amesbury Innovation High School where she was to begin teaching. North Andover schools Superintendent Jennifer Price said in a statement that Backler, who started working as a substitute in 2011 and has coached the boys’ and girls’ swim teams, has no current ties to the system or its students. She said the incident involved one student. Backler taught science and coached swimming during the 2013-14 school year and coached swimming during the 2014-15 school year, Price said. Her employment ended in February 2015, the superintendent said. The incidents that led to the criminal charges took place in 2014, according to a police report filed in court. While coaching the girls’ swim team, Backler became close to a 16-year-old swimmer and formed what Mader described as an “inappropriate relationship’’ that included taking the girl to physical therapy appointments, texting, and exchanging gifts. Mader said police interviewed Backler in June after the teen’s mother reported concerns about the relationship between the coach and her daughter. Backler “did acknowledge that she believed she had gotten too involved with that student and went on to say that there was no inappropriate contact,’’ Mader said in court. The police report said that while returning from swim meets at Regis College in Weston and Harvard University in Cambridge, Backler handed a single pill each time to the teenager who had complained of shoulder pain. The swimmer fell asleep, Mader said. On another occasion, Backler gave the girl a prescription bottle of what she called muscle relaxers. “She told the victim not to tell her mother that she was giving her the pills,’’ Mader said. Mader said police pulled Backler’s prescription records and learned she had filled prescriptions in 2013 for diazepam and Oxycontin. On her Amesbury school webpage, Backler is identified as Lizz and described as a first-year biology and life science teacher. Backler, the site says, has been a high school science teacher since 2009 and has also worked in the Reading public school district. Outside North Andover High on Tuesday afternoon, Jessica Wu said Backler coached her sons in swimming. She said one son told her that Backler acted more like a friend than a coach. Jeremy Saraceno, 17, said Backler had been his biology teacher. “I really wouldn’t think a teacher could have the mind-set to do this,” he said. Laura Crimaldi can be reached at laura.crimaldi@globe.com. Follow her on Twitter @lauracrimaldi. John R. Ellement can be reached at ellement@globe.com. Follow him on Twitter @JREbosglobe.